"Is it a bird? Is it a plane? 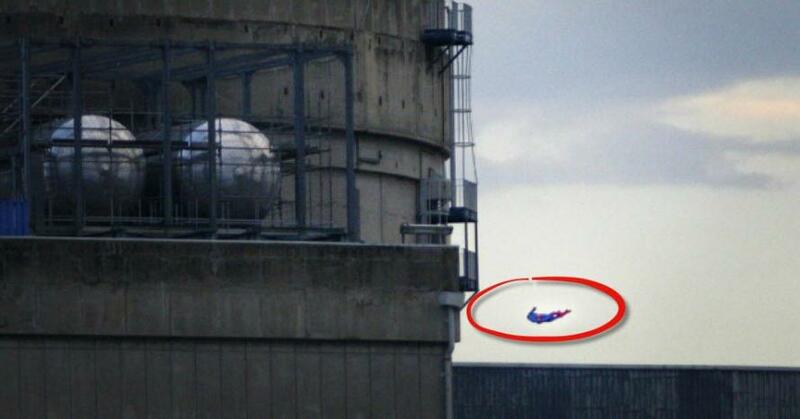 No... it's a drone dressed up as Superman, exposing how vulnerable French nuclear power plants are." Greenpeace France on Tuesday crashed a drone dressed as Superman into the Bugey nuclear energy plant, located about 20 miles east of Lyon, to expose how vulnerable that facility is to a terrorist attack and highlight the broader dangers of this type of power generation. The activists told AFP that the drone struck "a storage pool for spent nuclear fuel next to a reactor, one of the most radioactive areas at the site." "This is a highly symbolic action: it shows that spent fuel pools are very accessible, this time from the air, and therefore extremely vulnerable to attack," Yannick Rousselet, head of Greenpeace France's anti-nuclear campaign, said in a statement. Greenpeace France spokesman Cyril Cornier told Le Parisien, in French, that the action itself did not pose any danger to the plant, its workers, or the public, but insisted that by crashing the flying device into the plant's "most fragile point," they had proven beyond any doubt that the security of the facility "is absolutely not assured." Responding to the action, the French electricity group EDF said that police had intercepted one of two drones piloted by Greenpeace and announced plans to file a formal complaint with authorities. EDF also claimed, "The fuel building is key for security, designed in particular to withstand natural or accidental damage." Greenpeace EU, on Twitter, called EDF's response "worrying." Worrying repsonse from @EDFofficiel to @greenpeacefr's action at the Bugey nuclear plant: they said they "intercepted 1 of the 2 drones". France derives about 75 percent of its electricity from 19 state-controlled plants, according to the World Nuclear Association. Activists worldwide have repeatedly sought to draw attention to the dangers of this type of power generation—but particularly in France, where it is so prevalent. Last October, Greenpeace France activists entered another of EDF's nuclear plants and set off fireworks. At the time, the group emphasized on Twitter, "These installations are vulnerable." AFP reports that in February, "eight activists were sentenced to jail terms or fines" for participating in the firework action.